A new trailer for Disney's live-action Aladdin remake is imminent. The Mouse House has had a ridiculous amount of success in recent years in revisiting some of their animated classics and reimagining them for a new generation. This year sees several such movies on the studio's schedule, but perhaps the riskiest and most uncertain of them all is Aladdin, given the tepid response to the footage we've seen so far and the not-so-warm welcome given to Will Smith's blue Genie. This trailer has a lot riding on it. It's been officially announced that the first, full-length trailer for Aladdin will debut tomorrow on Good Morning America. Disney previously released a teaser trailer that didn't feature Genie in it at all. Then, during the Grammys, they released a lengthy TV spot that did feature Genie in his blue glory that sparked a whole lot of conversation online. Not all that much of it good. With that, this full-length trailer needs to show moviegoers why this remake is going to be worth their time and money. Mena Massoud, who stars as the titular character, also confirmed the news on Twitter. "Who's ready for a full length #Aladdin trailer? It's premiering tomorrow on GMA." While there are many elements that need to be nailed in order to make something like this work, the look, the music, not being a whitewashed mess, it's Will Smith taking on the role made famous by the late, great Robin Williams in the original animated version that is the make-or-break element. So far, both in his human "disguise" form and his blue form, people have largely been unimpressed, if not put off by it. Maybe with more context it will work? Maybe Disney has tweaked the design a little after the blowback? Maybe the story and visuals beyond Genie will do enough to get people on board? Unlike Tim Burton's Dumbo and Jon Favreau's The Lion King, which are also being released this year, this movie has yet to win people over. That's not to say Dumbo is going to be a runaway hit or anything like that, but it's not fighting the same uphill battle of negative press. It's a different beast altogether. Guy Ritchie, who sits in the director's chair for this one, is in the hot seat. Alice In Wonderland, Maleficent (which is getting a sequel this year), The Jungle Book and Cinderella have all been major hits for Disney and they have plenty of other similar remakes in the works, such as Mulan and The Little Mermaid. 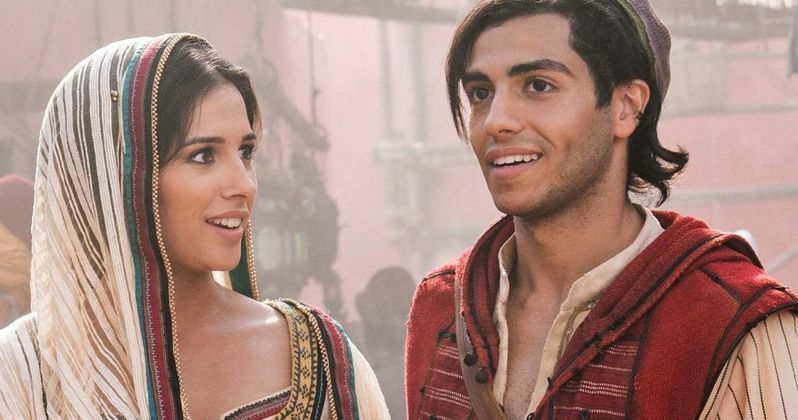 Naomi Scott (Power Rangers) is also on board as Jasmine, with Marwan Kenzari as the villainous Jafar. We'll be sure to bring the new trailer your way as soon as it's made available online following its debut tomorrow. Aladdin is set to hit theaters on May 24. Feel free to check out the announcement from the Good Morning America Twitter account below.